Of emergency department older patients with no prior history of cognitive problems, 30 to 40 percent will meet the criteria for either delirium or cognitive dysfunction, and this is often unsuspected by the physician.1 !2 Consequently, older patients should be routinely screened for cognitive dysfunction. The simplest screening tool is evaluation for orientation and three-item recall. If no problem is detected, no further testing needs to be done. If the screen is failed, further testing can be done. The Confusion Assessment Method (CAM) scale (Fig 300-2)16 is a useful tool for the emergency physician. Using the CAM scale, the patient is evaluated for (1) acute onset, (2) fluctuating course, (3) inattention, (4) disorganized thinking, and (5) altered level of consciousness. These factors are assessed through the emergency department history and observation, as well as structured questions such as three-item recall, stating the days of the week or months of the year backward. Patients who present with inattention—either acute onset or fluctuating course—and disorganized thinking or altered level of consciousness should be considered to have delirium and evaluated for acute medical problems as the cause. Cognitive function can be further assessed with formal mental status tools such as the Mini-Mental Status Exam (MMSE).17 These scales are useful because they are widely accepted as indicative of cognitive dysfunction and can be followed by different clinicians over time (Fig 300-3). FIG. 300-2. 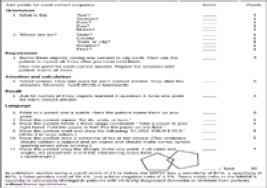 Confusion Assessment Method (CAM) worksheet. The diagnosis of delirium is suggested with the presence of the first two criteria and either the third or fourth criteria. From Inouye et al,16 with permission. FIG. 300-3. Mini-Mental State Examination (MMSE). Courtesy of Marshall Folstein. Reprinted from Folstein et al,17 with permission. Delirium, dementia, or decreased level of consciousness are usually obvious on history and physical examination. The Glasgow Coma Scale (see Chap 221) is useful for classifying a decreased level of consciousness. Acute mental status changes in older patients represent a medical emergency of presumed organic cause requiring extensive diagnostic tests to determine the etiology. The differential diagnosis is more difficult because a large number of disorders such as pneumonia, urosepsis, electrolyte imbalance, medication reaction, or congestive heart failure can cause a decrease in mental status.